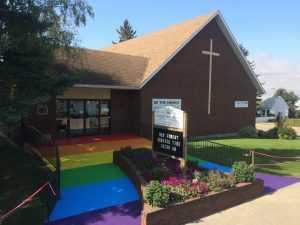 Welcome to Bashaw United Church! Our Sunday service is at 10:30 am and there’s a children’s program each week. We are a community of faith committed to following the Way of Jesus: living God’s love, sharing God’s love. We strive to be inclusive of all the diversity of God’s children regardless of age, gender, race, culture, sexual orientation, differing abilities, culture or economic circumstance. For each of us, our journey is unique, distinct and individual but we are connected to each other, bound to each other by God’s love. Here we can travel together in a place that is safe, open, supportive and inspiring. Everyone is invited to participate as they wish and are able. Belonging is more than just fitting in, it’s knowing that what you bring to the community is valued and appreciated and an integral part of who we are. The life of our church family is a blend of traditional and progressive and we offer many ways to experience the spirit, both on a Sunday morning and through the week. We use a variety of media and arts, engaging the rich creativity of our community. We are truly a seven day a week church. The place we gather is on lands walked for thousands of years by people of the First Nations. We acknowledge the history, culture and spirituality of the signatories to Treaty 6 and remember our responsibility as Treaty members. We also honour the heritage and gifts of Métis people. May we live the respect that our words offer. Office Hours: Tuesday and Thursday, 9:00 a.m. – 12:00 noon; Wednesday 9:00 a.m. – 4:00 p.m.